A collection of letters written by Mrs. Julie Hutt's fourth grade class to 1st Lieutenant David Falvey during his tour in Iraq. Read the students' letter to Lieutenant Falvey and his responses back to each individual student. Pictures of the letters, students, and Lieutenant Falvey's safe arrival back to the states are included! 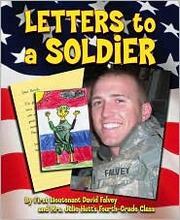 Falvey, David// Mrs. Julie Hutt's fourth-grade class, “Letters to a soldier,” Children's Picture Book Database at Miami University, accessed April 18, 2019, https://dlp.lib.miamioh.edu/picturebook/items/show/11304.